Aquarium Solutions PraziPro by Hikari is a ready-to-use, liquid concentrate, specially developed to effectively control unwanted parasites (including flukes, tapeworm & flatworm) in freshwater or marine aquariums. This safe, fast-acting product will not negatively impact biological filtration and is non-toxic to common aquarium animals or live plants. It is an excellent preventative agent and provides powerful treatment when used before Hikari Ich-X (as a separate treatment). Directions: Follow all bottle instructions. Use any time unwanted parasites are noticed or introduction is probable (i.e., when introducing new fish). Follow all directions on package for optimal effect. Do not stop filtration, but remove activated carbon and stop foam-fractionation (protein skimming) and UV sterilization. Seemed to work well in the treatment of external parasites (not ich). Hikaria claims that this non-toxic chemical does not negatively effect bio-filters while eliminating flatworms and other parasites. My strange squiggly white worm(?) with a white head and long tail slowly perished in my tank along with his buddies. 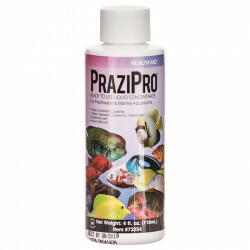 You can use Prazipro repeatedly every 3-5 days in case of re-infestation. I've had no signs of the worms after two treatments. I will use this med preventively whenever I introduce new fish. 1 oz bottle treats 120 gallons. One of my favorite goldfish came down with dropsy during her prazi treatment for flukes. It was so gentle that she didn't seem to notice it at all. Now not only has she recovered from dropsy, she is now fluke free. Used this to treat my stingray. Worked wonders!!! PraziPro is gentle enough that I didn't have to worry about disrupting my cycle. It got rid of my fish's flukes! Buy a bigger bottle than you think you need, because repeat treatments are a good idea. This is such a great product. 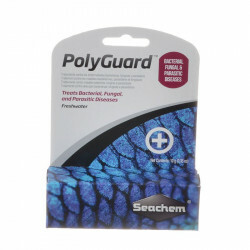 It slows down your bacteria a bit, but it has less adverse affects than some of the other materials out on the market.